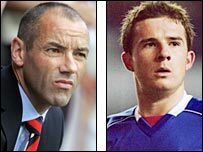 Paul Le Guen's relationship with Barry Ferguson was never likely to be a marriage made in heaven. On the other was a passionate Scottish captain who enjoyed talismanic status with the fans and liked to work hard and play hard. Le Guen attempted to downplay Ferguson's importance at the club by saying: "The role of the skipper isn't as important in France as it seems to be here. "I don't believe captains are as important to the players as some people think. We had a chat about that and Barry knows my way of thinking." Ferguson responded angrily after the match. "I read what the boss said and wasn't happy with that comment," he said. "The manager didn't say anything to me about it - there was no meeting. To me it's the most important job. I'm privileged to be captain." Le Guen shrugged insouciantly when told about Ferguson's response. "He thinks what he wants - I am the boss." In truth, Ferguson had long been unconvinced by the Frenchman's methods and tactics, while Le Guen believed his captain was undermining him with other players. Another major point of contention was drinking. A football journalist for a French newspaper who is very close to Le Guen told BBC Sport: "He would have liked the players to stop drinking alcohol - it was a big problem for him. "Arsene Wenger discovered the same problem when he arrived at Arsenal and one of Gerard Houllier's first acts at Liverpool was to ban alcohol on the team bus." Le Guen made an immediate stand over the issue when he sent Fernando Ricksen home from a pre-season training camp in South Africa following an alcohol-fuelled incident involving an air stewardess. The Dutchman was a former Rangers captain, joint SPFA player of the year in 2005 and a one-time favourite with the Ibrox fans. Yet Le Guen made it clear he would not be cowed by reputations by refusing to select Ricksen and subsequently selling him to Zenit St Petersburg. 606 DEBATE: Do Rangers fans expect too much? However, a drinking culture persisted and matters came to a head when Ferguson and several other players travelled to Newcastle for a Christmas party following the Celtic match. Le Guen reluctantly agreed to the trip, but only on the condition that the players did not drink. Despite his instructions, the players are believed to have turned up for training the worse for wear. Ferguson's final game under Le Guen was in the 1-1 draw against St Mirren on 30 December. According to the French journalist, the Scottish midfielder was asked to play in the hole behind the strikers by Le Guen, but disregarded his manager's instructions and roamed all over the pitch. The Frenchman was furious after the match and it was probably at this point that he decided to strip Ferguson of the captaincy, which he announced on New Year's Day. Ferguson, understandably, has a different take on events. Peter Kay, chief executive of the Sporting Chance Clinic, has been giving the 28-year-old help and support since he was stripped of the captaincy. Kay, who also worked with Ricksen, told BBC Sport: "Barry is very passionate about Rangers and is a natural leader. He didn't want to leave. "He wasn't undermining Le Guen and was completely bewildered when he lost the captaincy." Kay normally helps footballers with addictions, but he emphasised that his work with Ferguson has been nothing to do with this. "I've been helping Barry during an extremely difficult and stressful period in his life," he said. According to Kay, Ferguson is desperate to play for Rangers again, even if he is not captain and despite enquiries about his availability from Everton, Tottenham and Newcastle. In truth, Le Guen's problems at the club ran deeper than his relationship with Ferguson. The French journalist said that Le Guen had been told he would have only £1.5m to spend in the January transfer window - despite spending only about £2.5m in the summer. "At Rangers, the expectations do not match the reality," the journalist told me. "The fans want Rangers to be a big European club, but the money is not there." He does not think Le Guen will join another club soon, even though he has been linked with Marseilles and Paris St Germain. Meanwhile, Ferguson will attempt to force his way back into the Rangers team and win over some fans who are sceptical about his influence at the club. The player's devotion to the club is beyond question. 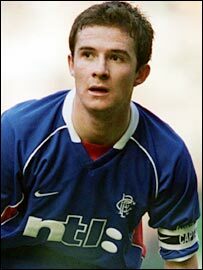 However, some Ibrox fans feel that as he was the first Rangers captain to ask for a transfer, prior to his departure to Blackburn in 2003, they were entitled to query his eventual return. Ferguson's autobiography, Blue, is a 268-page love letter to the Govan institution and his fee for the book was passed to the Rangers Charity Foundation. Yet a section of the club's fans are angry that the player's spat with Le Guen has ultimately led to the Frenchman's departure. Despite a dismal time in the league so far this season, Le Guen had led Rangers into the knock-out stages of the Uefa Cup and they have played some attractive football. Many believed that, given time, he could turn things around at Ibrox. Despite his major status and the fact he has probably been Rangers' best player this season, Ferguson will have much to do to win round some sceptics in the aftermath of an issue which has deeply divided Rangers supporters.